Empowered with AI, NLP, and Machine Learning technologies, Let’s Nurture helps in developing powerful Chatbots for businesses which will enable them to deploy a robust, smart, reliable and efficient automation of processes..
Why E-commerce brands should have chatbots for their business? The only constant thing in the Ecommerce industry is change. The ever-expanding realm of e-commerce industry has paved the way for various marketplaces and retailers nationally & internationally. Ecommerce chatbot is an innovation that has partially automated processes for the businesses. Chatbots help e-commerce businesses communicate with their target audience, deliver customer assistance, recommend products and drive sales,etc. Why Chatbot Development for Ecommerce makes sense? Customer support chatbots efficiently operate 24/7. Study says, 57% of customers quit shopping in-between if their query is not resolved instantly. Chatbots act as customer care executive and meet individual customer’s query while saving time for both customers and vendors. Chatbots are the best option to increase customer engagement and to boost customer experience. An intelligent Chatbot recommends products or styles based on the user’s previous answers or information they mentioned during onboarding. 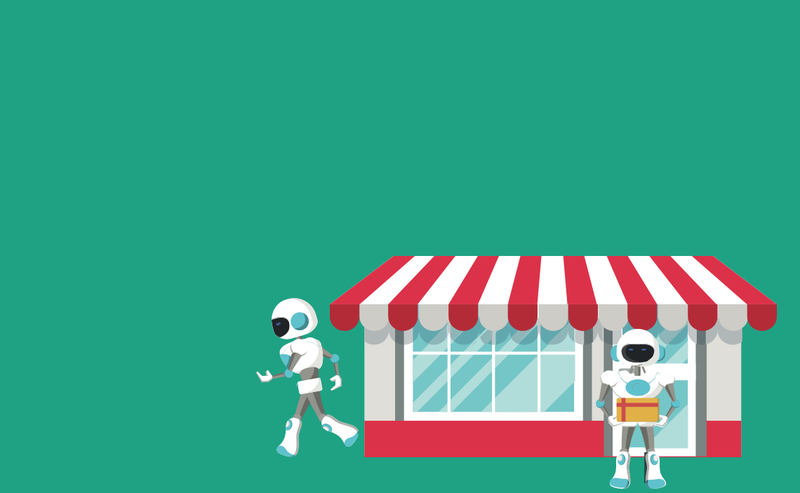 By combining the power of Machine Learning and conversations history, a smart chatbot can recommend various products that increase the customer's probability to purchase. One of the biggest headache for Online merchants’ is cart abandonment. Bots increase online checkout rate by providing personalized offers tailored to user’s specific purchase habits. Chatbots start tracking the customer activity, every time they add the products to the cart. Chatbots reminds the customers by sending push notifications regarding unfinished purchases. A chatbot can keep the visitor engaged on the website and filter these which are suitable for your products or services. Chatbots makes form filling processes look like a conversation, thus collecting details of the customer and converting them into leads. Either it results in direct sales, or it leaves you a warm lead that can be further matured, with high probability of success. Chatbots send push notifications of new products to the audience, tailored specific to their purchase habits, thus customers feel appreciated rather than irritated. Chatbots can send messages, announcements, run contests, and share details of upcoming sales or notification of a product in the wishlist running out of stock or product they were looking for arrived back in stock, to multiple users simultaneously. By integrating Chatbot solutions with shopping cart, brands can provide their customers with a wholesome shopping experience. Customers can browse through the available products, can add them to cart and make payment with due flexibility. Ecommerce chatbot ensures smooth purchase/return experience across channels and satisfies today’s customers who tend to blend shopping on web, mobile and in-store. Chatbots can respond quickly when your customers reciprocate or respond to your offers or recommendations made through push notifications and can help you make the most of your cross-sell and upsell endeavor. By gathering customer profiles and with assistance from product recommendation engines, Chatbots can sell new products to existing customers and direct buyers towards additional products that suit their taste. Live Chatbot can provide a cheaper alternative to help you cut down on recurring cost, provide a consistent service and immediate support to customers by addressing multiple queries at a time. Implementing Chatbots can help businesses to save up to 30% in terms of ongoing monthly expenses for customer support.They don’t go on a holiday or get sick and can cover your support 24/7 helping both your company and customers. E-commerce companies will have far better insights to customers, thanks to Chatbots. Chatbots can be used to track purchasing patterns and consumer behaviour by monitoring user data. This helps a company to decide “which products to market differently, which to market more and which to redevelop for relaunch”. Why choose Let’s Nurture for Chatbot development services? Our experienced team of Chatbot developers and consultants understand the pain points of clients and ensure to add business value by delivering the best interactive chatbot solution that can automate customer interaction on your website and social media channels by developing NLP powered Chatbots tailored to your specific requirement. Can I integrate Chatbot with existing E-commerce website or app? Yes, our in-house Chatbot developers can build Chatbot SDKs which can be easily implemented with new and existing web and mobile applications. Can Chatbots automatically learn questions asked by customers? Is there any facility to export the chat happened between bots and customers? Is there any way to identify customer location? Can you provide option to hire dedicated Chatbot developers?